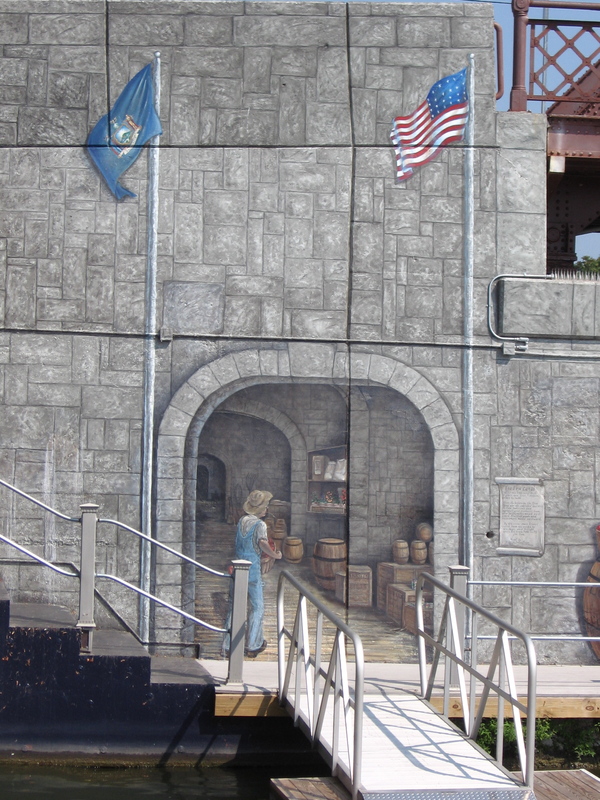 As we came around the corner into Newark, the first thing that caught my eye was the fantastic mural on the bridge abutment. Two men on ladders were adding small details and touch up to the realistic view of their rendition of the old canal and dock. The artistry in the piece was amazing! It was part of the Mural Mania project, which is promoting local history by creating large scale art pieces in different communities. We docked and got quickly set up in the blazing heat of the lingering days of summer. The officials of Newark had gone all out for us, and got us 5 hotel rooms at the Quality Inn right across the road from where we were docked. Instead of the usual grousing over who got the hotel room, it was now a minor brawl about who had to stay and watch the boat! It was really nice to relax in an air conditioned space and have easy access to a shower for the night. Our public day went very well, with hundreds of visitors coming out despite sweltering heat and baking sun to learn more about the history of the Lois McClure and the boats it is copied from. The evening was capped with a great musical performance, featuring traditional songs as well as a local violin group giving its second public performance.